The moment I first discovered I was an Empath. The moment I first discovered I was empathic. 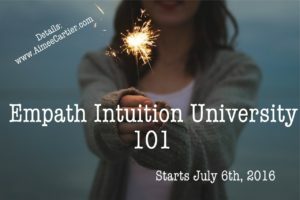 You see, in just a couple of weeks I’m starting a new Intuition University program JUST for Empaths. 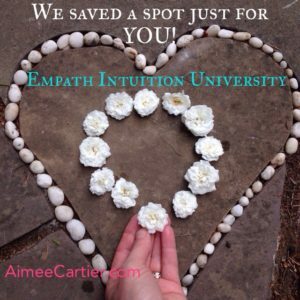 Here are all the details—(what an empath is, how to know if you are one, what the program is about etc.) So I thought I would write a little bit about that moment that I discovered I was one. It’s still crystal clear in my mind. All of it. It was a spring day around 14 years ago. 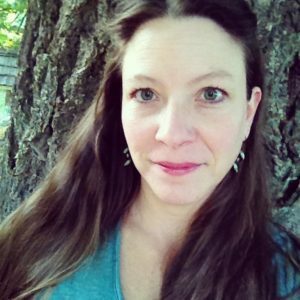 I was living in upstate New York as a writer on staff of a meditation ashram. I had just finished my work for the morning and was heading to lunch. When I walked out of my office it was so sunny and glorious outside. I remember I was walking up the wide steps (like palatial wide) to the dinning hall and I was so happy. There was no particular reason (other than the hours of meditation and chanting I did every week) that I was feeling so divine, but I remember noticing my mental state and taking in its loveliness. I was literally skipping. In my mind’s eye I can still see the cream-colored steps shining in the sun as my feet leaped up them into the dining hall. Within about 15 seconds I was getting my food when someone walked by me. All of the sudden I felt so grouchy. As I scooped a helping of lunch onto my plate I felt frustrated and irritable and I had this thought about not being able to get the last part of this chapter I was writing together. I was still completely confused when I finished getting my lunch and sat down by myself to eat my food. That’s when it all came crashing together. My thoughts, probably in this order were. Only 15 seconds ago I was unbelievably happy. What could have changed between then and now? Nothing has changed FOR ME since that moment. Then I looked up and identified who had walked by me. It was a woman who I knew was an author, and who was, as it so happened knee-deep in writing her own spiritual memoir. In that moment it felt like something HUGE in my life clicked. In almost one complete thought I realized: She just walked by me and I just (without even trying) downloaded her whole experience… AND I’ve been doing this MY WHOLE LIFE. I knew it all at once like that. It was so shocking to me I felt speechless. I’m pretty sure I sat there without eating for some moments just taking in/ reeling in the implications that this had for me. They were implications that I would unravel for months (years) to come. Like, how much of what I have thought and felt all my life was mine? Who am I anyway (without other people’s thoughts)? Do I even know? You see honestly no empathic person truly wants to download anyone else’s stuff. It’s overwhelming and confusing. You can never get to the end of the chapter! Because you AREN’T writing a chapter! Also it can totally derail YOUR whole experience like it did for me that day. I was happy! I was ecstatic actually. And suddenly I was not. I think that’s why it made such an impact on me that day. I was very aware of how I had been feeling and the transition was almost entirely opposite and happened in a matter of moments. The feeling of having someone else’s business in your body is, on the whole, not super pleasant. I didn’t want to be anyone else. I wanted to have access to my own internal state. I certainly didn’t want to be stewing and anxious about a chapter I wasn’t even writing! For me that was the beginning. It came in a very singular and poignant moment which was raw and extremely eye opening for me. I spent the next I would say three years learning how to handle what I now consider an empathic gift. (But believe me it didn’t really feel like it then.) Because in my experience it’s not until you really know how to handle yourself, and care for yourself as an empath that you really get the goodness of being one. I don’t mean to imply it’s all bad, but the life of the empath does take extra care and handling. Most of it is actually good (the handling), especially once you know how to do it and you can manage your abilities (i.e. learn to shut them off, or block out the information when you need to—which is seriously most of the time!) it does have very lovely things to offer. In my experience as a psychic, seeing many souls who have different abilities and do different work in the world, I’ve also seen how it serves each of us to be better at doing whatever it is we are here to do. And that is precisely why next month Empath Intuition University begins. July 6th, 2016 to be precise. And at the end of this six month program I intend every Empath with me to have the tools, skills, and know-how to not only manage their gift easily, but get out and rock their world, like only they can! I feel like I’m about 50% of this. And I have to say, I haven’t clicked your link in a while, I LOVE LOVE LOVE your site! I’ll be checking in more often my love. Life has changed so vastly for me in the last month. I’ve known that I was say special since I was 8 years old my dad’s first wife came to me over my bed I knew she was dead and I said Daddy Daddy she’s gone she’s gone the most beautiful woman is gone the next day my dad got a phone call that his first wife killed herself. I walk into a room and I can read the room I get the creeps from people that I don’t know listening to a child laugh is the most beautiful sound I could ever hear but being at Walmart makes me crazy and I sweat a lot I need help I need to know where I belong and what I can do to help others and how I can fine-tune my gifts I would love to talk to somebody about this I’m 52 years old now and it’s time that I embrace my gift rather than try to suppress it. Is there anybody that can help me please.